COOL FLAME ART GLASS STATUE home decor, jewelry, decor, decorations, electronics, fountains, floor mats, art glass, vases, garden essentials, fireplace screens. Cool hues of green, gold and blue make this a statement accent for your living room, dining room, or anywhere you want a drop of cool, sophisticated style. 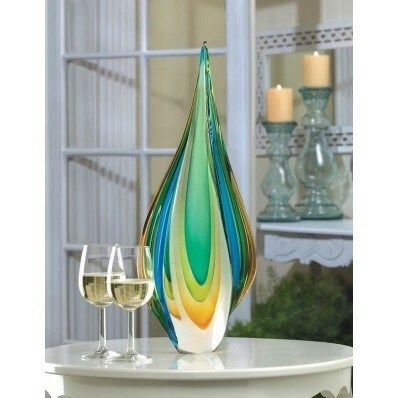 Like a blue flame captured in glass, this decor accessory is a stunningly gorgeous and contemporary piece of art. Individually hand-crafted for its unique beauty. Item may be slightly different from the picture shown here. Material(s): GLASS. Dimensions 18" x 7" x 5".